Virginia Democratic Gov. Ralph Northam is having a disastrous week. He stepped in it with appalling remarks about late-term abortion. 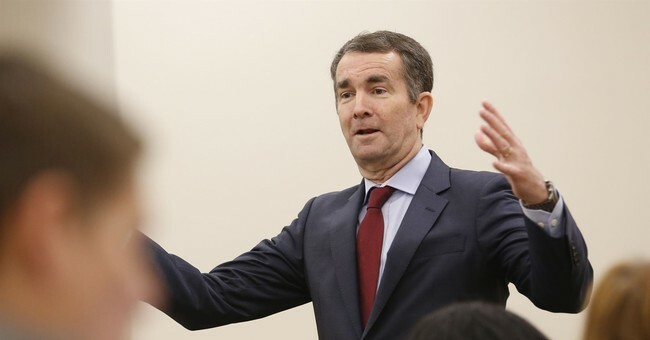 He doubled down, saying he had no regrets, even though many thought he was advocating for straight up infanticide; Virginia Democrats were pushing a bill that would have permitted abortions virtually up until the moment of birth. It was similar to the law New York passed. It’s ghastly. It’s immoral. It’s wrong. And it was rejected. I can't change the decisions I made, or cannot undo the harm that my behavior caused then, and today. But I accept responsibility for my past actions and I'm ready to do the hard work of regaining your trust. I have spent the past year as your governor fighting for a Virginia that works better for all people. I am committed to continuing that fight through the remainder of my term and living up to the expectations you set for me when you elected me to serve. Thank you. We stand with Democrats across Virginia and the country calling him to immediately resign. He no longer has our confidence or our support. Governor Northam must end this chapter immediately, step down, and let Lt. Gov. Justin Fairfax heal Virginia's wounds and move us forward. JUST IN: Former VP and potential 2020 presidential candidate Joe Biden: "There is no place for racism in America. Governor Northam has lost all moral authority and should resign immediately, Justin Fairfax is the leader Virginia needs now." Northam has faced a torrent of criticism and calls for his resignation after a photo surfaced from decades ago that showed two people in racist costumes: One person is dressed in blackface, and another is wearing a full Ku Klux Klan uniform. The photo appeared in Northam’s 1984 medical school yearbook. On Friday, Northam apologized for appearing in the photo. And this circus continues. So, when virtually the entirety of the Democratic Party was closing in around him, Northam decided to retract his apology and dig in? You cannot make this stuff up. After long think over, it’s not me, even though the photo is on my yearbook page. I guess we’ll have to keep digging. UPDATE: Press conference at 2:30 P.M. today. He's not resigning.